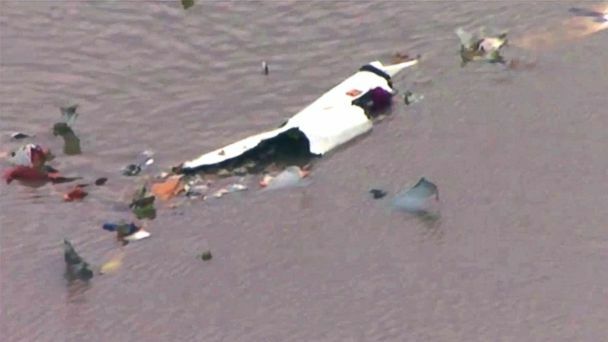 Three people are missing and killed by the crash of a twin-cargo plane into a bay near Houston, Texas, Saturday afternoon, officials said. The Boeing 767 jetliner, which was flying from Miami to Houston, crashed into the Trinity Bay near Anahuac just before 1 pm, officials said. The plane was operating on behalf of Amazon "and three people were on board, according to a statement released by Atlas Air Worldwide. Amazon officials confirmed Atlas statement, but directed questions about the missing passengers to Atlas. The prospects of surviving the crash appeared thin, local officials said. "I don't believe that anyway anyone could have survived , "said Chambers County Sheriff Brian Hawthorne at an evening press conference. Hawthorne said that multiple dive teams on hand have discovered human remains, but have yet to locate any black boxes which contain the aircraft's flight recorder. The sheriff said that the investigation could go on for weeks. "Our thoughts and prayers are with the flight crew, their families and friends along with the entire team at Atlas Air during this terrible tragedy," Dave Clark, Amazon's Senior Vice President of Worldwide Operations, said in a statement. "We appreciate the first responders who worked urgently to provide support. Investigators from the FAA and the National Transportation Safety Board (NTSB) are also involved in the nascent probe. The NTSB will be in charge of the investigation. US Coast Guard officials said in a statement That rescuers are searching for three crew members, the Houston Police Department, Texas Park and Wildlife, and the Harris County Sheriff's Department, among others, were assisting with the search. ABC News' Wil Cruz and Amanda Maile contributed to this report.